Timothy John Sims was born on 25 July 1897 in one of the cottages at Tobacco Box (then in Fretherne, but now within Frampton parish and known as 'Bacca Box'). His parents were William Henry Sims, a groom and later a gardener, and Elizabeth née Barton. He was baptised with his older brother, William, on 4 February 1907 at St Mary's, Fretherne, and after he left school Timothy was an errand boy for a grocer. Only the documents relating to the awarding of the Timothy's British War Medal and Victory Medal have survived; these records were not stored with the main Army records and therefore often survived destruction in the Second World War fire. 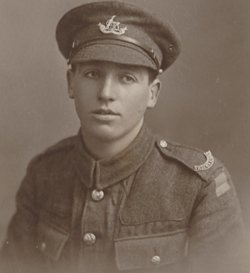 They show that he enlisted, not before 1 January 1916, into the 2nd Battalion of the Royal Warwickshire Regiment as a private, subsequently being transferred to the 2/7th and finally the 2/6th Battalions. These units all served on the Western Front, but in 1917 the 2nd Battalion was redeployed to Italy. It may be that Timothy Sims was posted at that time to the 2/7th, a second-line battalion (see the Gallery photo), which remained in France and was engaged in the battles of Langemarck (part of the Third Ypres campaign), Cambrai, St Quentin (part of the 1918 Somme campaign), the Lys (where the Division suffered many casualties), and finally on the Selle during the final Allied advance. This is in accordance with the account of his daughter, who believes that he was a runner and saw action at Ypres and St Quentin. He was demobilised on 11 November 1919. Timothy married Ethel Ivy Brocher at St Mary's on 18 September 1921. They had two daughters, Joy and Sibyl, and continued to live in the family home at Tobacco Box which Timothy bought from Frampton Court Estate in 1924. He undertook various jobs including a gardener at The Denhalls (now Wisma Mulia) and a general labourer for the Estate. Timothy John Sims died at home on 2 September 1981 and was buried in St Mary's churchyard three days later. His war service is commemorated on the plaque in the village hall.